The full library package contains some extra content such as web skins collection and a bunch of samples which are useful if you want to check various stuff you can build with this library. That’s all the info you should know to create your first Webix application. 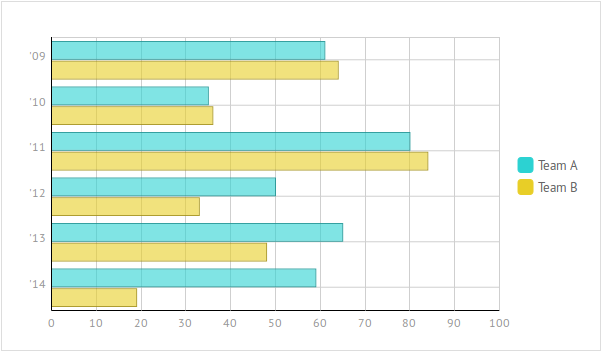 To learn how the things work, let’s build a simple Bar Chart and add some features to it. As you can see, Webix uses a rainbow-like palette by default. If it’s not what you expected, there’s always a possibility to change the default properties. Other handy properties are radius and alpha. You can use them to change the bar’s rounding and opacity. It may be useful to combine two or more charts to compare the data they represent. To create a combination of charts, you can use the series property. The main idea behind this approach is that you should use the properties are common for all of your charts within the chart definition (like we did it before). But the properties that relate to a particular chart from the chart series should be placed within the series array. In this code we’ve defined two charts that use different data and have different colors. To avoid misunderstanding, you can use Map Legend and Tooltips. Map legend can be pretty useful in case you combine two or more charts. To create a legend, you should add the legend property to your chart configuration. Another handy feature is a tooltip. You can use it to show the exact value of a bar and some extra information, if any. Let’s add this feature to our chart. If you use a combination of charts like in our example, you should create as many tooltips as many charts you have. template:"Team A. Year: 20#year#. Sales: #sales#"
template:"Team B. Year: 20#year#. Sales: #sales2#"
The tooltip property creates a popup message that appears on the screen when a mouse cursor is over the related chart item. The template property defines the contents of this message. We’ve created a string that takes the year and sales values from the data source. Don’t be confused with 20#year# definition. Remember that the year values are as follows: 05, 06, 07, and so on. So, such format only makes everything clear. If you want to check out the source code and the demo, you can visit this snippet page. Feel free to play with the code! Obviously there are much more chart types than a good old bar chart. To switch between different types of charts, you have to change the value of the type property. Remaining steps are swapping the X-axis and Y-axis properties and changing the size of the DIV container. The configuration process for the Line Chart differs from the previous ones, so let’s take a look at it in detail. Once again, you should use the type property to create a Line Chart. But there are some unique properties. 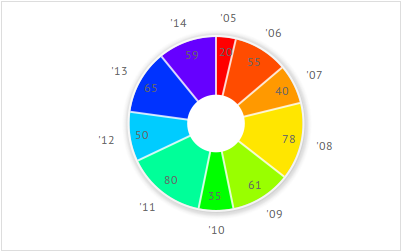 Unlike the previous chart types, Line and Spline Charts use the line property to define the chart appearance. Moreover, there’s another property you may find handy. If you look closer at the bar charts we created earlier, you’ll notice that the first bar is drawn with an offset. To change this behavior, you can use the offset property. Pie, 3D Pie, and Donut Charts are similar to each other. The main difference between them is their appearance that is defined by the type property. This code doesn’t differ much from the Bar Chart we’ve created earlier. But this time there’s a pieInnerText property that allows setting a template for pie inner labels. 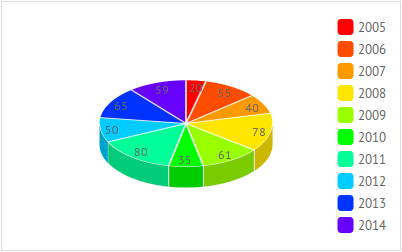 If you think that using legend along with pie chart is not the best decision, you can always choose the label property. Webix allows creating charts without wasting a lot of your precious time. It’s not so hard to change the chart type. Just change the value of its type property and you’ll see what happens. 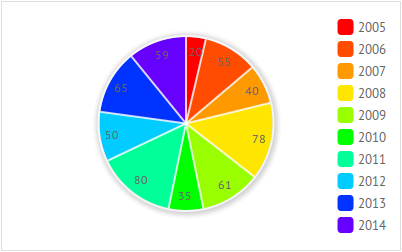 This article covers the basics of the chart creation process. There’s a possibility to change the foreground color, redefine the appearance of markers that present chart data items, etc. To learn which type of chart is better for this or that situation, read this article about different types of charts. And, of course, Webix is not limited to charts functionality. It provides you with a wide variety of controls, such as Buttons, Sliders, Forms and other useful stuff. Combining the available components you can create an online app that gives users a possibility to visualize the existing data in different ways, make on-the-fly changes and who knows what else. If you want to take a look at how different Webix components can work together, check GanttPRO. It’s an online service that was build with Webix components. It allows visualizing the workflow in the form of a Gantt chart. Well, seems that all for now. Hope you liked it.